Definition at line 20 of file MessageBucket.h. Definition at line 25 of file MessageBucket.h. Definition at line 17 of file MessageBucket.cc. Definition at line 66 of file BandwidthBucket.cc. References Comm::IoCallback::conn, debugs, min(), and BandwidthBucket::quota(). Referenced by ClientInfo::applyQuota(), Comm::Write(), and BandwidthBucket::~BandwidthBucket(). Referenced by quota(), BandwidthBucket::reduceBucket(), and BandwidthBucket::refillBucket(). Definition at line 37 of file BandwidthBucket.h. References len, BandwidthBucket::reduceBucket(), and BandwidthBucket::selectWaiting. the number of bytes this bucket allows to write, also considering aggregates, if any. Negative quota means no limitations by this bucket. Definition at line 23 of file MessageBucket.cc. 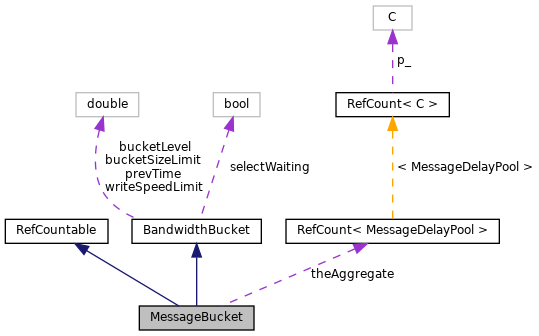 References BandwidthBucket::bucketLevel, MessageDelayPool::level(), min(), BandwidthBucket::noLimit(), MessageDelayPool::noLimit(), MessageDelayPool::refillBucket(), BandwidthBucket::refillBucket(), and theAggregate. Definition at line 36 of file MessageBucket.cc. References MessageDelayPool::bytesIn(), BandwidthBucket::reduceBucket(), and theAggregate. Referenced by BandwidthBucket::noLimit(), quota(), and ClientInfo::quota(). Definition at line 43 of file MessageBucket.cc. References COMM_SELECT_WRITE, Comm::IoCallback::conn, F(), Comm::Connection::fd, fd_table, Comm::HandleWrite, BandwidthBucket::selectWaiting, Comm::SetSelect(), and fde::writeQuotaHandler. References fde::clientInfo, RefCount< C >::getRaw(), ClientInfo::writeLimitingActive, and fde::writeQuotaHandler. Referenced by ClientInfo::kickQuotaQueue(), quota(), ClientInfo::quota(), BandwidthBucket::reduceBucket(), BandwidthBucket::refillBucket(), and ClientInfo::setWriteLimiter(). Referenced by BandwidthBucket::refillBucket(), and ClientInfo::setWriteLimiter(). Referenced by BandwidthBucket::BandwidthBucket(), BandwidthBucket::refillBucket(), and ClientInfo::setWriteLimiter(). Referenced by checkTimeouts(), commHandleWriteHelper(), ClientInfo::kickQuotaQueue(), BandwidthBucket::onFdClosed(), scheduleWrite(), ClientInfo::setWriteLimiter(), and Comm::Write(). Definition at line 35 of file MessageBucket.h. Referenced by quota(), and reduceBucket(). Referenced by BandwidthBucket::noLimit(), BandwidthBucket::refillBucket(), and ClientInfo::setWriteLimiter().